The sinoatrial node in the right atrium normally serves as the natural pacemaker for the heart (Fig. 1). These pacemaker cells manifest spontaneous depolarizations and are respon sible for generating the cardiac rhythm; such a rhythm would be classified as an intrinsic, automatic one. The frequency of this earliest depolarization is modulated by both sympathetic and parasympathetic efferent innervation. 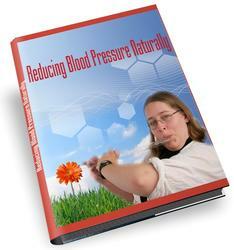 In addition, the nodal rate is modulated by the local perfusion and chemical environment (i.e., neurohormonal, nutritional, oxygenation, and so forth). Although the atrial rhythms normally emanate from the sino-atrial node, variations in the initiation site of atrial depolarization have been documented outside the histo-logical nodal tissues, particularly at high atrial rates (27-30). The most conspicuous feature of the sinoatrial nodal cells is the poorly developed contractile apparatus (a feature common to all of the myocytes specialized for conduction), comprising only about 50% of the intracellular volume (31). Although it cannot be seen grossly, the general location of the sinoatrial node is on the "roof" of the right atrium at the approximate junction of the superior vena cava, the right atrial appendage, and the sulcus terminalis. 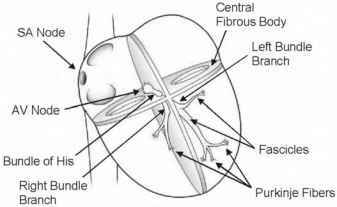 In the adult human, the node is approx 1 mm below the epicardium, 10-20 mm long, and up to 5 mm thick (32). For more details on cardiac anatomy, refer to Chapter 4. After the initial sinoatrial nodal excitation, the depolarization spreads throughout the atria. The exact mechanisms involved in the spread of impulses (excitation) from the sinoatrial node across the atria are controversial. However, it is generally accepted that: (1) the spread of depolarizations from nodal cells can go directly to adjacent myocardial cells, and (2) preferentially ordered myofibril pathways allow this excitation to transverse the right atrium rapidly to both the left atrium and the atrioventricular node. Fig. 2. The conduction system of the heart. Normal excitation originates in the sinoatrial (SA) node, then propagates through both atria. 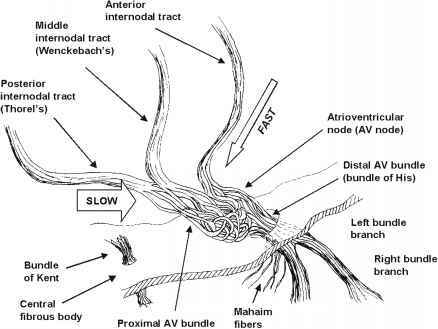 The atrial depolarization spreads to the atrioventricular (AV) node and passes through the bundle of His to the bundle branches/Purkinje fibers. electrical routes between the nodes. They are microscopically identifiable structures, appearing to be preferentially oriented fibers, that provide a direct node-to-node pathway. In some hearts, pale-staining Purkinje-like fibers have also been reported in these regions (tracts are shown as dashed lines in Fig. 1; see also internodaltracts.jpg on the Companion CD). The anterior tract extends from the anterior part of the sinoatrial node, bifurcating into the so-called Bachmann's bundle (delivering impulses to the left atrium) and a tract that descends along the interatrial septum and connects to the anterior part of the atrioventricular node. The middle (or Wenckebach pathway) extends from the superior part of the sinoatrial node, runs posterior to the superior vena cava, then descends within the atrial septum and may join the anterior bundle as it enters the atrioventricular node. The third pathway is the posterior (Thorel) pathway, which generally is considered to extend from the inferior part of the sinoatrial node, passing through the crista terminalis and the eustachian valve past the coronary sinus to enter the posterior portion of the atrioventricular node. In addition to excitation along these preferential conduction pathways, general excitation is spread from cell to cell throughout the entire atrial myocardium via the specialized connections between cells, the gap junctions (which exist between all myo-cardial cell types, see Section 5). Toward the end of atrial depolarization, the excitatory signal reaches the atrioventricular node. This excitation reaches these cells via the aforementioned atrial routes, with the final excitation of the atrioventricular node generally described as occurring via the slow or fast pathways. The slow and fast pathways are functionally, and usually anatomically, distinct routes to the atrioventricular node. The slow pathway generally crosses the isthmus between the coronary sinus and the tricuspid annulus and has a longer conduction time, but a shorter effective refractory period than the fast pathway. The fast pathway is commonly a superior route, emanating from the interatrial septum, and has a faster conduction rate, but a longer effective refrac tory period. Normal conduction during sinus rhythm occurs along the fast pathway, but high heart rates or premature beats often conduct through the slow pathway because the fast pathway may be refractory at these rates. In general, the atrioventricular node is located in the so-called floor of the right atrium, over the muscular part of the inter-ventricular septum, and inferior to the membranous septum. Following atrioventricular nodal excitation, the depolarization proceeds through to the bundle of His (also referred to as the common bundle or His bundle). The anatomical region in which the His bundle and the atrioventricular node both reside has been termed the triangle of Koch. The triangle is bordered by the coronary sinus, the tricuspid valve annulus along the septal leaflet, and the tendon of Todaro. After leaving the bundle of His, the depolarization spreads to both the left and the right bundle branches. These pathways carry depolarization to the left and right ventricles, respectively. Finally, the signal travels through the remainder of the Purkinje fibers and ventricular myocardial depolarization spreads (see 7-1.mpg [the conduction system] on the Companion CD). In addition to the normal path of ventricular excitation, direct connections to the ventricular myocardium from the atrioven-tricular node and the penetrating portion of the bundle of His have been described in humans (34). The function and prevalence of these connections, termed Mahaim fibers, is poorly understood. An additional aberrant pathway existing between the atria and ventricles has been termed Kent's bundle (the clinical manifestation of ventricular tachycardias caused by the presence of this pathway is termed Wolff-Parkinson-White syndrome). This accessory pathway is commonly ablated. Alternate representations of the cardiac conduction system are shown in Figs. 2 and 3, with details of the ventricular portion of the conduction system shown in Fig. 4. More specifically, the left bundle branch splits into fascicles as it travels down the left side of the ventricular septum just below the endocardium (these can be visualized with proper staining). These fascicles extend for a distance of 5-15 mm, fanning out over the left ventricle; about midway to the apex of the left ventricle, the left bundle separates into two major divisions, the anterior and posterior branches (fascicles). These divisions extend to the base of the two papillary muscles and the adjacent myocardium. Fig. 4. 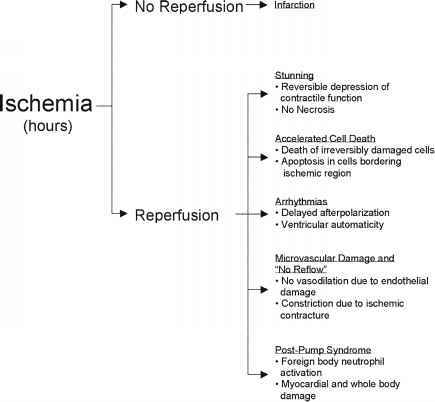 The ventricular conduction system. The Purkinje network has a high interspecies and intraspecies variation, which likely results in variability in excitation and contractile patterns within the ventricles and may even lead to differences in cardiac fiber architecture. This variability is evident in the dramatic differences seen in the degree and morphology of the cardiac trabeculations (which typically contain these fibers). A.V., atrioventricular. Redrawn from D. L. DeHann, Circulation, 1961, 24, 458. Fig. 5. Conduction velocities and intrinsic pacemaker rates of various structures within the cardiac conduction pathway. The structures are listed in the order of activation during a normal cardiac contraction, beginning with the sinoatrial (SA) node. Note that the intrinsic pacemaker rate is slower in structures further along the activation pathway. For example, the atrioventricular (AV) nodal rate is slower than the SA nodal rate. This prevents the AV node from generating a spontaneous rhythm under normal conditions because it remains refractory at rates above 55 beats/ min. 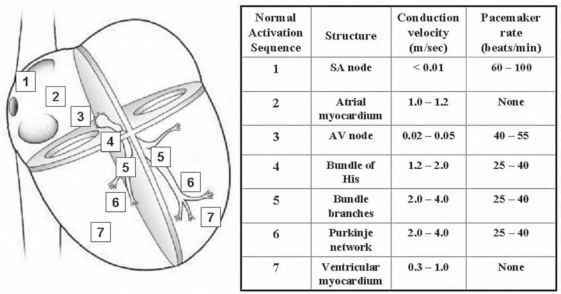 If the SA node becomes inactive, the AV nodal rate will then determine the ventricular rate. Tabulation adapted from A. M. Katz (ed. ), Physiology of the Heart, 3rd Ed., 2001.
expected that variations in the left ventricular conduction patterns also exist. It should be noted that one of the most easily recognized conduction pathways commonly found in mammalian hearts is the moderator band, which contains Purkinje fibers from the right bundle branch (see Chapter 5). Three criteria for considering a myocardial cell a "specialized conduction cell" were proposed by Aschoff (35) and Monckeberg (36) in 1910 and included: (1) histologically discrete features, (2) ability to track cells from section to section, and (3) insulation by fibrous sheaths from the nonspecialized contractile myocardium. 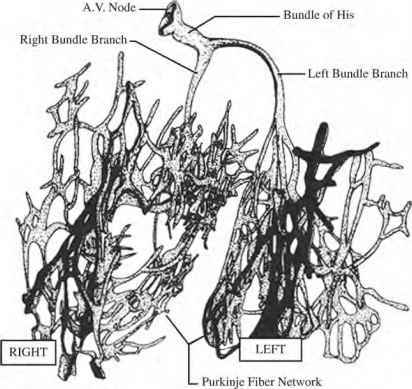 It is noteworthy that only the cells within the bundle of His, the left and right bundle branches, and the Purkinje fibers satisfy all three criteria. No structure within the atria meets all three criteria, including Bachmann's bundle, the sinoatrial node, and the atrioventricular node (which are all uninsulated tissues). Which is the fastect conduction rate in sinoatrial node or purkinje fiber? What is the name for bundles that faciltates the rapid conduction to left atrium?